Horticulture encompasses a unique blend of art, science and technology. Horticultural crops include trees, shrubs, tropical plants, herbs, flowers, fruits, vegetables and nuts which are grown and used throughout the world. The horticulture industry is the second largest agricultural industry in the state and offers graduates a multitude of diverse career opportunities. The Department of Horticultural Sciences offers two undergraduate degrees: a Bachelor of Science in Horticulture and a Bachelor of Arts in Horticulture. Our flexible degree plans enable students opportunities to develop programs tailored to their unique goals. Degree requirements are posted in the official HORT UG Manual 2019-2020. Students must meet requirements set forth in the Texas A&M University catalog which is current in the year of their first registration, and the catalog is updated on an annual basis. The official University Catalog for the current academic year can be accessed here. Degree Plans for the corresponding year of entry to Texas A&M can be found at the bottom of this page. The Bachelor of Arts (BA) degree blends traditional horticulture with the benefits derived from the human association with plants. This degree offers students the option of pairing a horticulture degree with electives in social sciences, business, education, art and design. 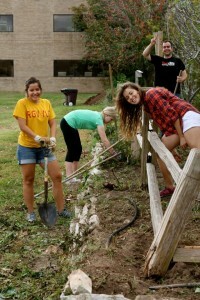 Creative opportunities range from planning gala events, to designing tranquil gardens, to constructing educational programs for school gardens to pursuing advanced degrees. Graduates may find themselves working in exciting environments including botanical gardens, international flower markets or upscale resorts. The Bachelor of Science (BS) degree is designed to provide students with the knowledge and skills needed for production, management and marketing of horticultural and floriculture crops. This degree also offers students with strong interests in science and/or technology opportunities in research related fields including graduate studies. Career prospects range from producing specialty herb crops for upscale restaurants, to managing landscape businesses for growing communities, to marketing fruits and vegetables for healthier lifestyles. Many former students are self-employed, owning their own greenhouse, nursery or landscape operation. Others work in upper management of large corporations or travel the world developing future horticultural crops. An undergraduate minor in HORT provides students a concentration of courses that focus on areas of horticulture. These may range from a broad based, comparative perspective to a narrower application within the field. Students may choose such diverse topics as fruit and vegetable production, enology, greenhouse and nursery management, floral and landscape design, science and biotechnology, urban and environmental horticulture and much more. Earning a minor in HORT provides students with the skills required to have a basic working knowledge in the field of Horticulture. Request information to learn more about pursuing a degree in Horticulture.